We Have X-Pole Sport Dance Poles For Sale! Dreaming of turning your living room into a pole fitness studio? Or aiming to open your own pole dancing school in your local area? Well, we have some exciting news for you… We have four X-Pole Sport dance poles for sale! X-Pole are the leaders in pole fitness. This Sport Pole is designed specifically for beginners – though professionals and more advanced students can practice their moves on this dance pole too! This dance pole is ideal if you’re looking for something which is easy to install and set up. X-Pole have designed this Sport Dance Pole to require no ladders during installation and needs no transition between A-Pole to B-Pole, so you can started straight away! 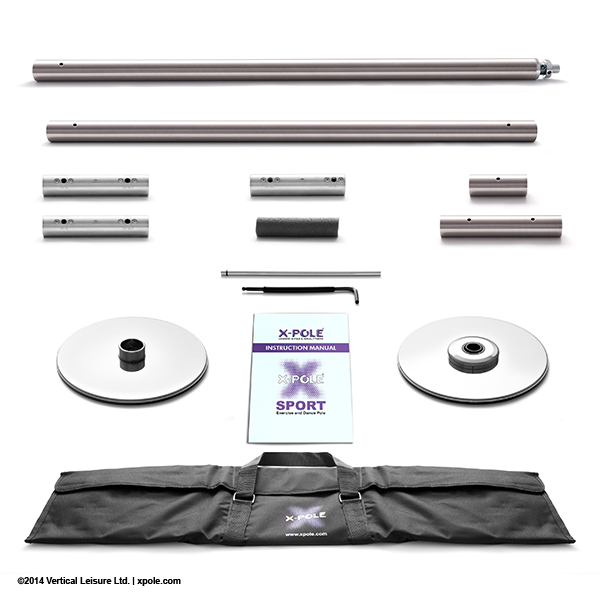 You can find the X-Pole Sport Dance Pole for sale on eBay for £115 (RRP £149.99). We currently have one up for sale, but will have three more added in the coming weeks. Please get in touch with us on eBay or directly if you are interested in purchasing multiple dance poles. The X-Pole Sport is 40mm in length and is extremely sturdy and stable, making it ideal for beginners. This dance pole has been used, but is in brilliant condition, with just a few small scratches, which are shown in the photos. • Revolutionary X-Joints – easy to use, quick to install. • Smooth Pole from Top to Bottom – no transition between A-Pole to B-Pole. • Small Upper Plate – for installation under one joist. • Extendable from 2235mm (7′ 4″) to 2745 (9′) from the box. • Carry Case (included) – holds a complete SPORT Pole. If you have any questions about our X-Pole Sport Dance Poles for sale, please don’t hesitate to get in touch.